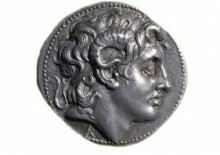 Alexander of Macedon (356 – 326BC) is shown as a youthful warrior posed on a pedestal. 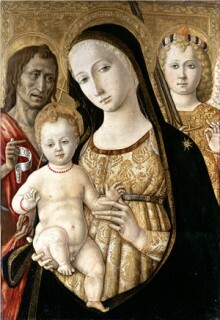 This is one of a series, showing virtuous men and women of antiquity, which decorated a palace in Siena. The inscription underlines the moral. ‘I, Alexander, who conquered the whole world with my own strength, shook off the flames of desire from my heart. It is of no avail to rejoice in the outward triumphs of war if the mind lies sick and rages within’. The small scenes in the distance illustrate Alexander’s virtuous behaviour towards the family of Darius, whom he had defeated in battle.